The 'DARK CITY' chapter of 'ZERO YEAR' reaches its conclusion in this amazing, extra-sized issue! Now, the next chapter of Zero Year is almost upon us, and we've saved the best for last! 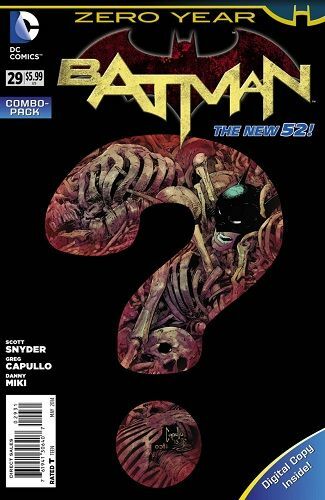 What corners of Batman's past will be revealed? And how will they impact his very near future? Find out here! Retailers: This issue will ship with three covers. Please see the order form for details. This story was previously solicited to appear in BATMAN #28. This issue is also offered as a combo pack edition with a redemption code for a digital download of this issue.